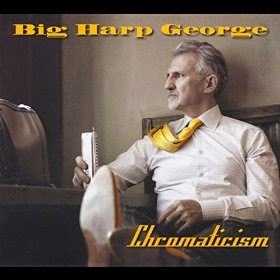 I just received the newest release, Chromaticism, from Big Harp George and it's really super. Opening with traditional swing track, Smack Dab In The Middle, Big Harp George Bisharat leads the way with a really solid voice. Chris Burns does a really nice job on keys and Kent Bryson adds a really cool vibes solo adding a different flavor. On Crazy About You Baby, Raja Kawar revs up the drums and Little Charlie Baty joins on guitar. Bisharat is a natural band leader with a spot on vocal delivery and harmonica accompaniment. Original track, Left So Soon, is a real cooker, down deep in the blues and George milks the blues from his harp. Rusty Zinn steps up on guitar on this track really adding a nice shine to an already smokin track. Excellent! My Baby Is Now On My Mind is a cool shuffle again with Zinn on guitar. The chromatic guitar really shines on this track and Zinn kicks off a gallop with his prime solo on this track aided by Kawar. Title track, Chromaticism, is a strong driving instrumental boogie with hot harp riffs. Little Charlie is back on guitar and rides it hard. Another excellent track! Hard Way, given a Latin twist on the blues specifically by the bass lead by Kid Anderson and Kawar on drums. Again George shows just how colorful and diverse a chromatic harp can be. Cellphone Hater takes the pace back down giving Zinn space to grind out some really tasty guitar riffs. Michael Peloquin adds some really nice sax and Chris Burns is tight on keys. Little Charlie leads the way with some really flavorful riffs to open Strolling Down Bliss Street, a swinging boogie. George really gets some cool tone cranked up on this track and Baty takes a really sweet solo to wrap it up. Cocktail Hour is a laid back jazzier blues track with a looseness that gives the harmonica air. Backed along the melody by Bryson on vibes is a really cool effect and Baty lays down some really hot guitar riffs. Very nice! Bryson steps out with a cool vibes solo adding something you don't typically hear on a contemporary blues album. Very cool! Classic blues track Someday is done just beautifully. I have always loved this track and George lays in the groove and lets it happen. Burns alternating back and forth between piano and organ is a cool effect and Georges vocals are heartfelt. On original track, Hey Jaleh! George dabbles into Cajun territory with just a taste of spice on a traditional Chicago sound. Chromatic harp and Zinn on guitar is a really nice match on the break. Smokin! Wrapping the release is Drum Boogie which really cooks! Lead by Peloquin on sax, he really gets this track hopping! This iss a hot band and they don't hold anything back , letting it all out on this track. Baty lays down some really crisp riffs and Kawar is tight on the bottom. Excellent! This will definitely end up on my best of the year....watch for it!